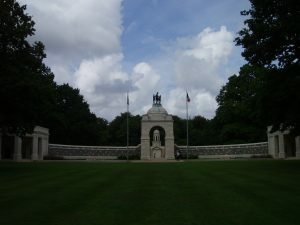 The battle for Delville Wood was fought from 15 July until 3 September 1916. The wood remained in German hands after the capture the town of Longueville on 9 July by the 9th Scottish Division. The wood had to be taken and cleared of Germans before a further attack could be launched on the notorious German Switch Line. 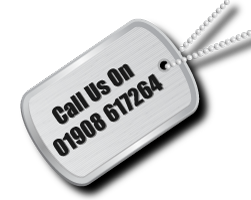 The task of capturing the wood was handed to the South African Brigade consisting of some 121 officers and 3,032 men, attached to the 9th Scottish Division. At dawn on the 15 July, 2nd, 3rd and 4th regiments of the South African Brigade commanded by Lt Col William Tanner assaulted the wood and by 09:00 were successful in securing the perimeter. German counter attacks were unsuccessful and by evening the 1st South African Regiment entered the woods. The following day they launched an unsuccessful attack during which a bombing party, led by Lt A W Craig, was pinned down by German machine gun fire. 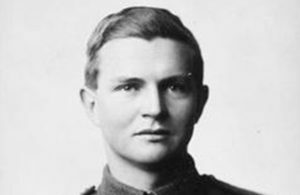 Private Faulds and two others left their trench and rescued the wounded Craig. During the following two days German and South African Forces attacked and counter attacked in an effort to capture and hold the wood. The fighting was vicious and hand to hand fighting ensued. Lt Col Tanner was wounded and commanded was assumed by Lt Col E Thackeray. Private Faulds (pictured left) performed a second act of bravery and was award the Victoria Cross. By 18 and 19 July consecutive German attacks drove the South Africans to the south western corner of the wood and on the 20th the British 3rd Division relieved them. A wounded Col Thackeray, some wounded officers and a total of 140 men left the wood. 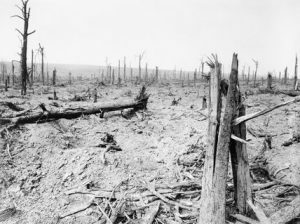 Despite a massive effort, the wood was not captured fully until 25 August and by the 14th (Light) Division. Today a memorial to the South African Brigade and a museum stand just inside the wood. It is looked after by the South African Government. 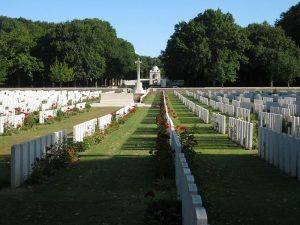 Delville Wood Cemetery which sits on the outskirts of the wood contains 5,493 burials. Almost two-third of those buried here are unknown.